display, I splurged on a 36-plant tomato version and a 72-plant regular version. I also bought The Veggie Gardener’s Answer Book by Barbara W. Ellis. I took my treasures home and started reading. The book is super easy to read and very easy to understand – I didn’t need “Gardening for Dummies” after all. I read the pages about starting seeds and checked the Old Farmer’s Almanac frost chart for Portland and realized that I needed to get started now! My grandparents and parents always consulted the Old Farmer’s Almanac for farming and gardening advice. Grandpa had a farm and everyone in our family had a big, successful garden. I guess I need to buy that next! I started planting the seeds and realized I didn’t want to go overboard with tomatoes, as I get some from my CSA subscription. But I also wanted plenty to roast and freeze or make into sauce and freeze for the winter. I planted at least 8 Romas for freezing and paste, at least 5 Early Girls for slicing (and hopefully for earlier maturing), and four cherry tomatoes. 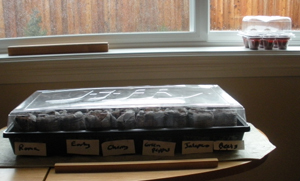 I also planted green peppers and jalapenos. But I didn’t want to go overboard with them and had a row left. I decided to plant the beets there. The Jiffy Greenhouse has little disks of peat moss wrapped in netting. You add water to the base and they soak up the water and expand. Then you fluff up the top of each disk (now a tube) and plant 2-3 seeds per disk. You cover it with the clear plastic dome and let them sprout. Once they have sprouted, you prop open the top and put them in a sunnier location till they are big enough to transplant. I found an online review that had helpful hints such as transferring the sprouted disks to a clear plastic cup as some will sprout sooner than others. I shall get to work with the 72-plant greenhouse next. I have beets, beet greens, collards, carrots, sweet onions, onions, lettuce, and basil to plant. I couldn’t find my old seed packets for mesclun mix, cilantro, or chard. I’ll have to pick those up before I start sprouting more in the 72 pack. The Veggie Gardener’s book recommends growing things you can’t easily buy in the store. For me, that means things I don’t get from my CSA in enough quantity for my needs, or only get rarely. All of the seeds except for the tomatoes are things I don’t get enough of from the CSA. I didn’t get seeds for cucumbers or squash or green onions or radishes – I get plenty of those from the CSA. I look forward to seeing my babies sprout!